My niece Avery only wants to feed herself so meal time can get just a tad messy. Actually its a disaster so my sister Laura is always looking for products that can help her keep the chaos to a minimum. I came across Bumkins- the makers of fine baby products who came to the rescue! Bumkins strives to make their products both practical and attractive which have become a major hit with parents. As a parent, I want safety first, but if my little one can look cute too then its an added bonus! 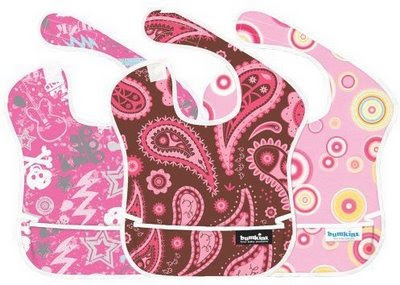 Bumkins sells bibs, aprons, smocks, waterproof bags, cloth diapers, gift sets and blankets to name a few. Their best-selling product is the SuperBib which has been a hit with parents since its inception in 1991. I was happy to have the chance to try out the Pink Paisley SuperBib on my niece, Avery. Not only is the SuperBib aesthetically pleasing, but it also has other outstanding qualities. It’s waterproof, stain and odour resistant and PVC, BPA, Phthalate and vinyl free. It’s easy to clean since its machine washable and can be worn numerous times. You simply wipe it off after each meal. It’s also made in the USA as I’m sure many of you want to support your local economy. This bib is easy to put on and take off since it does have a Velcro closure at the back of the neck. The catch all pocket on the front of the bib catches any food that misses your baby’s mouth. Trust me that little catch all comes in handy! My sister loved the SuperBib for Avery. She thought the design was gorgeous and found it so easy to care for. She like that she could bring it with her when she travels because it does wipe down so easily and you are not required to machine wash it after every meal. It’s also a good size so it will cover up your baby well and protect their clothing. They offer a large selection of fabrics and the price per SuperBib is $7.95 so a good price there. Excellent product! To purchase any of Bumkins baby products, please visit their site or find a store near you.